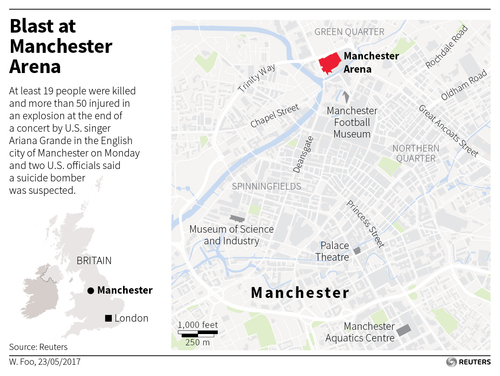 Reuters UKAt least 22 people, including some children, were killed and 59 wounded when a suicide bomber struck as thousands of fans streamed out of a concert by U.S. singer Ariana Grande in the English city of Manchester on Monday. British finance minister Philip Hammond said he would return to London from Brussels earlier than planned after an attack in Manchester killed 22 people and injured 59 late on Monday. Hammond said he would return to London straight after a meeting of European finance ministers on Tuesday morning. 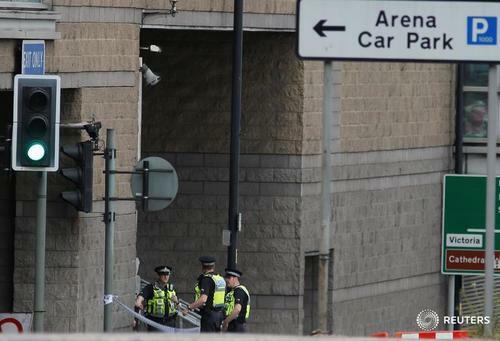 The British government's emergency security committee was due to meet on Tuesday to discuss the attack at a concert staged by U.S. singer Ariana Grande. 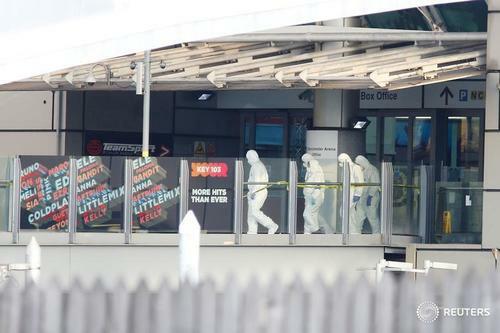 Police said the device was detonated by a male suicide bomber. Reuters UKBritain's political parties have agreed to suspend election campaigning until further notice following an explosion in Manchester that killed 19 people at a concert by U.S. singer Ariana Grande. 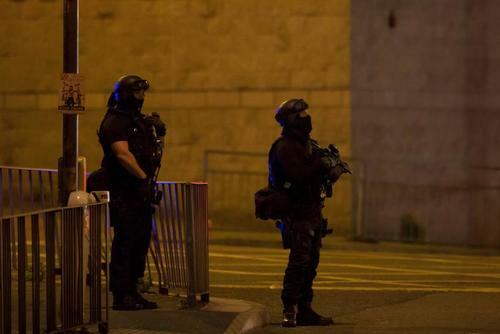 Reuters UKCountries from the United States to Japan and Singapore are considering tightening security ahead of major theater and sports events following a suicide bomb attack in Britain that killed at least 22 people. 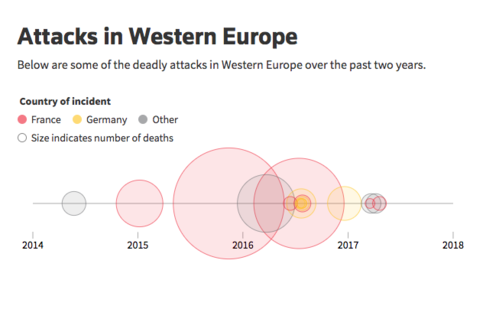 View a timeline of attacks in Western Europe over the past two years. God bless the family and friends affected by this nightmare. We are deeply shocked by last night’s terrible events at the Manchester Arena. Our thoughts and prayers go out to all those affected. London Mayor Sadiq Khan said there will be more police on the streets of the British capital after a suicide bomber killed at least 22 people and wounded 59 at a concert by U.S. singer Ariana Grande in the English city of Manchester. "I am in constant contact with the Metropolitan Police, who are reviewing security arrangements in London," Khan said in a statement posted on Twitter. "Londoners will see more police on our streets today." 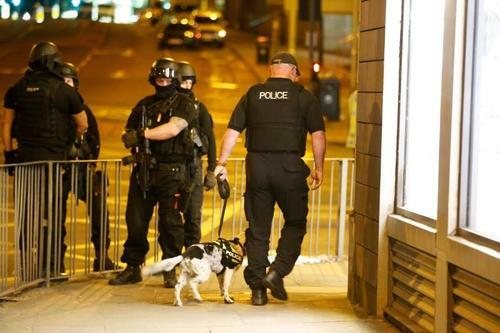 ReutersThe leaders of Europe sent Britain offers of support and sympathy following the suicide bombing of a pop concert in Manchester overnight that killed 22 people, including children. BREAKING: Trump offers prayers to people of Manchester, extending 'Deepest condolences' after terrorist attack. MORE: Trump says perpetrators of Manchester attack are "evil losers"
U.S. President Donald Trump extended his condolences on Tuesday to the victims of the Manchester suicide bombing that killed 22 people and said those behind the attack were "evil losers". Trump, speaking after talks with Palestinian President Mahmoud Abbas in the town of Bethlehem in the occupied West Bank, said the United States stands in "absolute solidarity" with the British people. "I extend my deepest condolences to those so terribly injured in this terrorist attack, and to the many killed and the families, so many families of the victims," Trump said. "So many young, beautiful innocent people living and enjoying their lives murdered by evil losers in life." 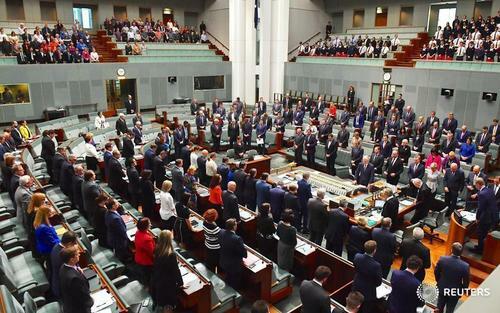 “This is an utterly appalling attack. My thoughts are with the people of Manchester as they try to come to terms with the horrific events that took place in their city last night.Our colleagues from Greater Manchester Police and their emergency services showed huge bravery as they ran towards the confusion and danger. “We are providing every possible support through the counter terrorism network as investigators work tirelessly to understand what has happened. “Here in the Capital we put extra police officers on duty as Londoners started their journeys into work. This will continue for as long as it is needed, and the mix of armed and unarmed officers are there to reassure. “Looking ahead to the weekend - a normal busy and vibrant weekend in our city - we are working with all those planning events to make sure we are doing all we can. You've got the wrong city if you think hate will tear us apart. Devastating news this morning. Thoughts and prayers are with all those affected. ReutersU.S. 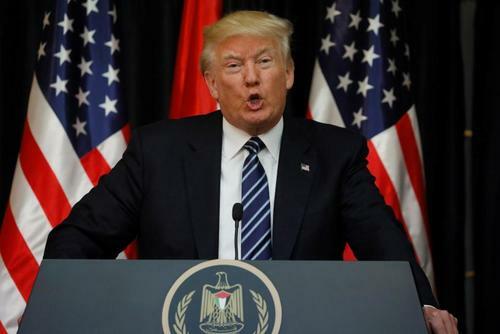 President Donald Trump extended his condolences on Tuesday to the victims of the Manchester suicide bombing that killed 22 people and said those behind the attack were "evil losers". Broken hearted for the families tonight. Broken hearted for Ari. Broken hearted for the state of this world. ???? From Barcelona, all our support and solidarity for the victims and relatives of the attack in Manchester.